Holy Roman Emperor Maximilian II. Maximilian II (July 31, 1527 – October 12, 1576) was king of Bohemia from 1562, king of Hungary from 1563, and emperor of the Holy Roman Empire from 1564 until his death. He was a member of the of the House of Habsburg. Maximilian grew up while the Ottoman Empire expanded to its greatest extent into the European space, and despite several efforts to push the Turks back from Hungary never succeeded in doing so. He also grew up as the Protestant Reformation swept through the German states of the Empire. As some princes opted to support the new tradition, governance of the Empire became increasingly complicated. Maximilian is mainly remembered for his remarkable policy of religious toleration, as well as for supporting reform within the Roman Catholic Church. He was interested in the idea of developing a common creed that might be accepted by all his subjects. Although this project was not successful, it represented an early effort to restore Christian unity. Efforts to restore imperial control of Hungary and, towards the end of his life, to pursue a claim on the throne of Poland, may have prevented him from finding a solution to the internal problems of the empire. As the empire grew, the challenge of holding it together would also grow harder. To Maximilian's credit, however, the Empire did not collapse into a bloodbath of religious fanaticism as long as he ruled. After his death, this erupted in the Thirty Years’ War, when the empire split into the Catholic and Protestant Unions. He appears to have regarded religion as a matter of personal choice, not something that the state dictates. His thinking anticipated later developments, in which many countries constitutionally separate religion from the state, arguing that the state cannot dictate what their citizens must believe. Born in Vienna, Maximilian was a son of his predecessor, Ferdinand I, Holy Roman Emperor, and Anna of Bohemia and Hungary (1503–1547). Anne was a daughter of King Ladislaus II of Bohemia and Hungary and his wife Anne de Foix. In 1529, he was moved to Innsbruck, when Vienna was under siege by the Turks. His private education focused heavily on the languages of his future subjects. He proved to have a gift for linguistics, mastering (as well as his native German), French, Spanish, Italian, and Czech while a "eulogy at his funeral" in 1576, added "two additional languages, Dutch and Magyar" to this list. Given the multi-national composition of the empire, this skill would prove very useful. It was at Innsbruck that he was tutored by Wolgang Severus, who joined the staff as a language tutor around about 1536. Pfauser had been with Martin Luther at Wittenburg from 1523 to 1523, where he had also befriended the "reformer's friend and disciple, Philipp Melanchthon. Maximilian appears to have learned something about Lutheranism at his stage, although when Ferdinand realized where the tutor's sympathies lay, he summoned the whole household and informed them that anyone caught discussing "the new religious teachings with his children" would be executed. He gained some experience of warfare during the campaign of his paternal uncle Charles V, Holy Roman Emperor against France in 1544, and also during the War of the league of Schmalkalden (a war of 1543 against an alliance of Protestant princes within the Empire), and soon began to take part in imperial business. Having in September 1548 married his cousin Maria, daughter of Charles V, he acted as the emperor's representative in Spain from 1548 to 1550, returning to Germany in December 1550, in order to take part in the discussion over the imperial succession. Charles V wished his son, Philip (afterwards king of Spain), to succeed him as emperor, but his brother Ferdinand, who had already been designated as the next occupant of the imperial throne, and Maximilian objected to this proposal. At length a compromise was reached. Philip was to succeed Ferdinand, but during his reign Maximilian, as king of the Romans, was to govern Germany. This arrangement was not carried out, and is only important because the insistence of the emperor seriously disturbed the harmonious relations which had hitherto existed between the two branches of the Habsburg family; an illness which befell Maximilian, in 1552, was attributed to poison given to him in the interests of his cousin and brother-in-law, Philip II of Spain. About this time he took up his residence in Vienna, being engaged mainly in the government of the Austrian dominions and in defending them against the Turks. The religious views of the king of Bohemia, as Maximilian had been called since his recognition as the future ruler of that country in 1549, had always been somewhat uncertain. His relations with the Protestant princes was amicable from the start of his reign. From 1555, with the Peace of Augsburg, it was agreed that princes could choose whether their states would be Catholic or Protestant (Protestant meant Lutheranism; Calvinsim was not recognized). The pope was so infuriated by the arrangement that he threatened to depose the emperor. In Vienna, Maximilian appointed Sebastian Pfauser as his court preacher. He "quarreled violently with his father" over this employment" due to doubt about Pfauser's orthodoxy. Pfauser was "known to be married, though his open conversion" to Protestant Christianity "took place only after he was forced from Maximilian's court." Fears were freely expressed that he would definitely leave the Catholic Church, and when Ferdinand became emperor in 1558, he was prepared to assure Pope Paul IV that his son should not succeed him if he took this step. Maximilian remained nominally a follower of the older faith, although his views were tinged with Lutheranism until the end of his life. After several refusals he consented in 1560 to ban Pfauser, but arranged asylum for him with the Protestant Elector of the Palatinate. Ferdinand had sent spies to listen to Pfauser preach, who informed him that they heard him commit "thirty-eight heresies." Long after the preacher left his services, Maximilian continued to pay him a pension. For three years, Maximilian did not receive communion. On February 7, 1562, however, he swore to his father that he would remain Catholic. He did so only after, at his father's request, the Pope granted him the privilege of taking communion in both kinds (brad and wine) but only in private. Fichtner comments, "That Maximilian never again communed in the traditional way is a sign that real conviction lay behind his stubborn demand for the privilege." Hence, Maximilian never again took the sacrament as part of an act of public worship. In November 1562, Maximilian was chosen as King of the Romans, or German king, at Frankfurt, where he was crowned a few days later, after assuring the Catholic electors of his fidelity to their faith, and promising the Protestant electors that he would publicly accept Peace of Augsburg when he became emperor. He also took the usual oath to protect the Church, and his election was afterwards confirmed by the papacy. However, he did not take communion in public, a normal part of the ceremony (which would have been of one kind, bread only) but in private. Ferdinand's anxiety about Maximilian's Catholic identity had always been more focused on the election than on concern for the state of his son's soul; there was a rival candidate from Hungary, whose Catholic loyalty was in no doubt. In September 1563, he was crowned king of Hungary by the Archbishop of Gran Nicolaus Olahus, and on his father's death, in July 1564, he succeeded to the empire and to the kingdoms of Hungary and Bohemia. Coat of Arms of Maximilian. The new emperor had already shown that he believed in the necessity for a thorough reform of the Church. He was unable, however, to obtain the consent of Pope Pius IV to the marriage of the clergy, and in 1568, the concession of communion in both kinds to the laity was withdrawn. He refused, though, to allow the publication of the decrees of the Council of Trent. Amidst general expectations on the part of the Protestants, he met with the Diet of Augsburg in March 1566. He refused to yield to the demands of the Lutheran princes to allow a Lutheran church in Austria. He did, however, negotiate Protestant assistance for the Turkish War, which had just been renewed. Collecting a large army he marched to defend his territories in the East; but no decisive engagement had taken place when a truce was made in 1568, and the emperor continued to pay tribute to the sultan as the price of peace in the western and northern areas of the Hungarian kingdom still under Habsburg control. The same year he gave substantial freedom to Lutherans in the south, in return for which the princes promised to help him repay debts "many of them inherited from his father." He also launched a project to write a creed that "all his people could adopt," an early attempt at forging Christian unity. In 1570, he gave members of the nobility the freedom to worship as they chose. In Bohemia, he left the Ultraquists alone, who, though nominally Catholic, gave communion in both kinds. 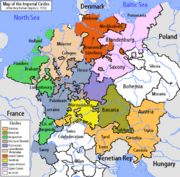 States within the Holy Roman Empire, based on 1512 boundaries. Meanwhile the relations between Maximilian and Philip of Spain had improved; and the emperor's increasingly cautious and moderate attitude in religious matters was doubtless due to the fact that the death of Philip's son, Don Carlos, had opened the way for the succession of Maximilian, or of one of his sons, to the Spanish throne. Evidence of this friendly feeling was given in 1570, when the emperor's daughter, Anna, became the fourth wife of Philip; but Maximilian was unable to moderate the harsh proceedings of the Spanish king against the revolting inhabitants of the Netherlands. In 1570, the emperor met the diet of Speyer and asked for aid to place his eastern borders in a state of defense against the Ottomans, and also for power to repress the disorder caused by troops in the service of foreign powers passing through Germany. He proposed that his consent should be necessary before any soldiers for foreign service were recruited in the empire; but the estates were unwilling to strengthen the imperial authority, the Protestant princes regarded the suggestion as an attempt to prevent them from assisting their co-religionists in France and the Netherlands, and nothing was done in this direction, although some assistance was voted for the defense of Austria. Maximilian's power was in reality very limited without the cooperation and support of the princes. The Holy Roman Empire consisted of semi-autonomous principalities except for territory directly under the emperor (Austria, Bohemia, and Royal Hungary). Ferdinand had centralized the administration which may have aided efficiency but failed to promote unity. It was inability rather than unwillingness that prevented him from yielding to the entreaties of Pope Pius V to join in an attack on the Turks both before and after the victory of Lepanto in 1571; and he remained inert while the authority of the empire in north-eastern Europe was threatened. In 1575, Maximilian was elected by the Polish and Lithuanian magnates to be the King of Poland in opposition to Stephan IV Bathory. However, he failed to become widely accepted there and was soon forced to abandon Poland, intending to press his claims through invasion. Maximilian died on October 12, 1576, in Regensburg while still preparing to invade Poland. On his deathbed, he refused to receive the last sacraments of the Church. He is buried in St. Vitus Cathedral in Prague. By his wife Maria he had a family of nine sons and six daughters. He was succeeded by his eldest surviving son, Rudolf, who had been chosen king of the Romans in October 1575. Another of his sons, Matthias, also became emperor; three others, Ernest, Albert, and Maximilian, took some part in the government of the Habsburg territories or of the Netherlands, and a daughter, Elizabeth, married Charles IX of France. Maximilian's policies of religious neutrality and peace in the Empire afforded its Roman Catholics and Protestants a breathing-space after the first struggles of the Reformation. Given the blood-bath that took place over religion during this period, his religious toleration was a remarkably enlightened, humanitarian policy. Fichtner argues that this was based as much on his personal convictions as on any pragmatic desire to prevent social chaos or to retain the support of Protestant rulers, crucial in times of war; "it would be a mistake to think that Maximilian's behavior was solely a product of political calculations." He "would not have persisted in his views to the point where he came close to losing both land and position unless he had been prompted by spiritual conviction." However, he disappointed the German Protestant princes over refusing to allow a Lutheran establishment in Austria. Yet, on a personal basis, he granted freedom of worship to the Protestant nobility and worked for reform in the Roman Catholic church, including the right of priests to marry. He was a strong advocate of communion in both kinds. This failed because of Spanish opposition. His wife, Maria, was in comparison a "one-woman redoubt of Catholic orthodoxy" while two of his sisters were generous supporters of the Jesuits. One, Archduchess Magdalene, "all but bankrupted herself" in the process. Ferdinand had invited the Jesuits to Vienna, in 1551, as part of his support for the Counter-Reformation. Fulton says that Maximilian's allegiance remained unclear; "on his deathbed, he refused the last sacrament in any form." When challenged about his sympathies, he had replied that he "was neither papist nor evangelical but simply a Christian." He did not regard the sacraments as necessary for salvation, "salvation was possible for all who read the Scripture seriously and who were touched by grace." Anna of Austria (1549-1580) (November 1, 1549-October 26, 1580). Married Philip II of Spain. She was the mother of Philip III of Spain. Ferdinand of Austria (March 28, 1551-June 25, 1552). Rudolf II, Holy Roman Emperor (July 18, 1552-January 20, 1612). 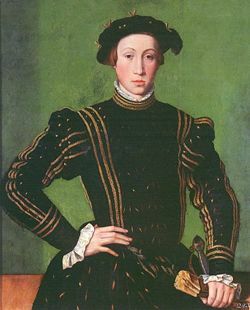 Archduke Ernest of Austria, (July 15, 1553-February 12, 1595). He served as Governor of the Low Countries. Elisabeth of Austria (June 5, 1554-January 22, 1592). Married Charles IX of France. Marie of Austria (July 27, 1555-June 25, 1556). Matthias, Holy Roman Emperor (February 24, 1557-March 20, 1619). A stillborn son (born and deceased on October 20, 1557). Maximilian III, Archduke of Austria (October 12, 1558-November 2, 1618). He served as grandmaster of the Teutonic Order and Administrator of Prussia. Albert VII, Archduke of Austria (November 15, 1559-July 13, 1621). He served as Governor of the Low Countries. Wenzel of Austria (March 9, 1561-September 22, 1578). Friedrich of Austria (June 21, 1562-January 16, 1563). Marie of Austria (February 19-March 26, 1564). Named after her deceased older sister. Karl of Austria (September 26, 1565-May 23, 1566). Margaret of Austria (January 25, 1567-July 5, 1633). A nun. Eleonore of Austria (November 4, 1568-March 12, 1580). Fichtner points out that by many standards, "including his own," Maximilian would be considered a failure. He failed to push back the Turks. He also failed to resolve Catholic-Protestant tension, although he tried very hard. Yet, his effort to try to reconcile the new and the old expressions of Christianity and his policy of toleration were still enlightened. Perhaps what most handicapped him was the close relationship between Church and state, so that rulers were expected to support and even to privilege one branch of the faith. The solution to the problems confronted by Europe at this time lay in the polity of church-state separation, which leaves people free to worship as they choose. That policy, at this point, would have satisfied neither side. Maximilian's claim to be "simply a Christian" and his belief that all who are touched by grace can be saved suggests that he would have preferred faith to be left to individual conscience, not dictated by the state. His efforts to keep the peace between the rival traditions could not prevent the Thirty Years' War, which broke out in 1616, when the empire fragmented into the Catholic and Protestant Unions. ↑ 1.0 1.1 Fichtner (2001), 9. Fichtner, Paula S. 2001. Emperor Maximilian II. New Haven, CT: Yale University Press. ISBN 9780300085273. Fichtner, Paula S. 2003. The Habsburg Monarchy, 1490-1848: Attributes of Empire. Houndmills, Basingstoke, Hampshire, UK: Palgrave Macmillan. ISBN 9780333737279. Fulton, Elaine. 2007. Catholic Belief and Survival in Late Sixteenth-Century Vienna: The Case of Georg Eder (1523-87). Aldershot, UK: Ashgate Pub. ISBN 9780754656524. Kaufmann, Thomas DaCosta. 1978. Variations on the Imperial theme in the Age of Maximilian II and Rudolf II. New York: Garland Pub. ISBN 9780824032319. Louthan, Howard. 1997. The quest for compromise peacemakers in counter-Reformation Vienna. Cambridge studies in early modern history. Cambridge, UK: Cambridge University Press. ISBN 9780585039725. History of "Maximilian II, Holy Roman Emperor"
This page was last modified on 29 August 2008, at 14:29.